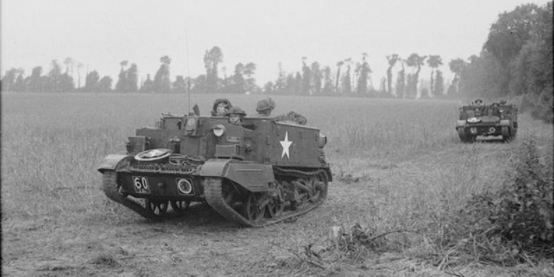 Used extensively by Commonwealth forces in all theaters throughout WWII, the Universal Carrier served as a transport, a towing vehicle and a quick-response weapons platform for machine guns, flamethrowers, anti-tank guns and mortars. So popular were these agile and flexible vehicles that production ran until 1960 and over 100,000 eventually rolled off the assembly line, making them the most-produced armoured combat vehicle ever produced. With my new British forces moving along, I picked up a few inexpensive packages of Universal Carriers in the flea market at Fall In! this past weekend. The models from Battlefront come three to a carded package in solid-cast resin with metal crew and gun options. 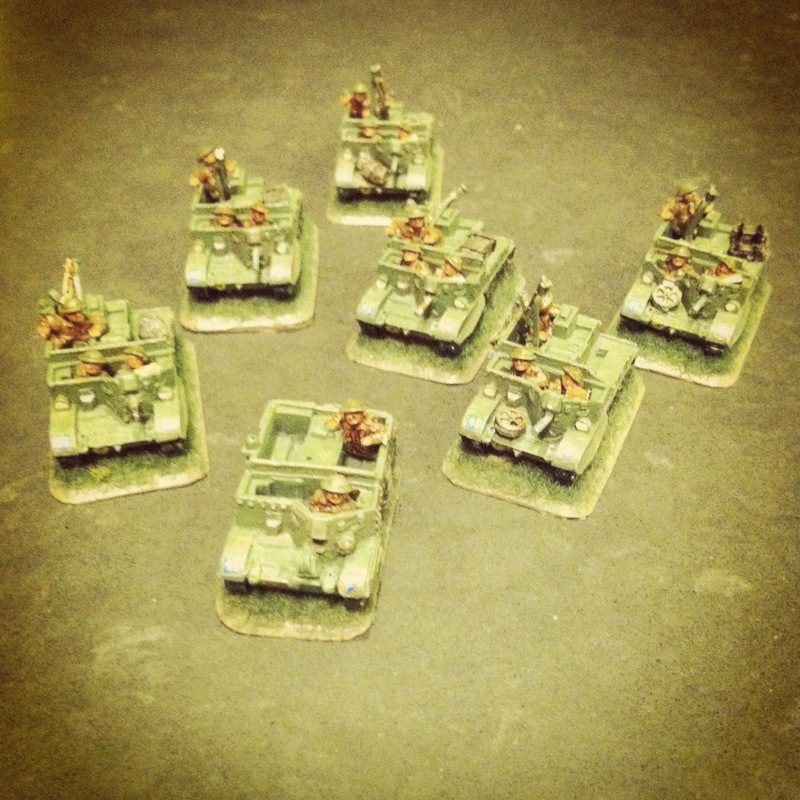 The packs I got were the early war models but I decided for gaming purposes I’d fudge them a bit to make them work in my late war gaming. 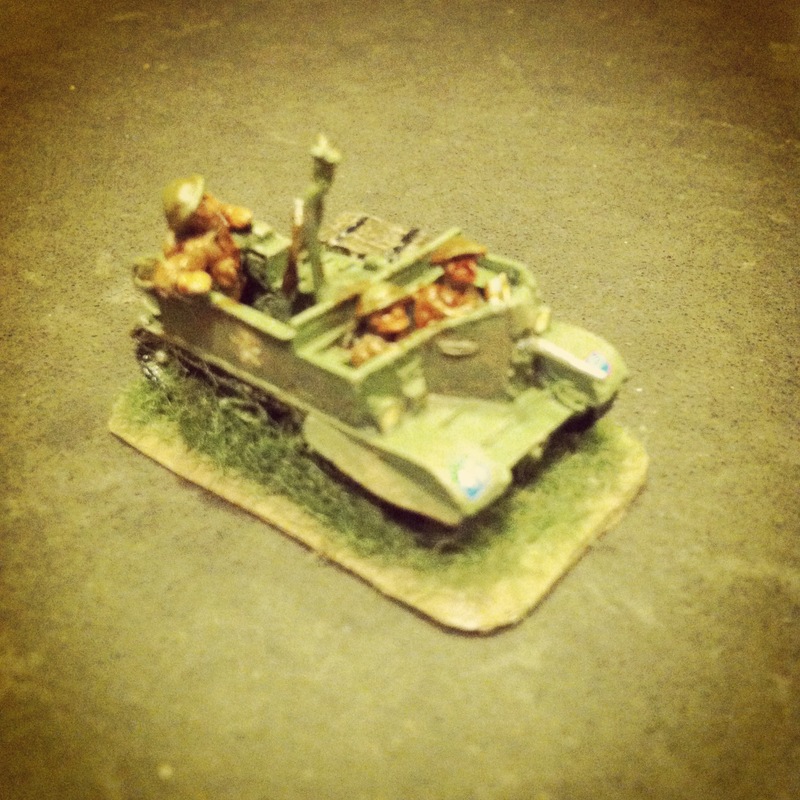 Along with a carrier from my Royal Artillery battery I’m also working on, I’d wind up with seven vehicles to start. I chose to model my inital six carriers with extra 50 cal. machine guns, hoping to use them to quickly get into a fight and pin down German infantry with a hail of bullets. Adding the 50 cal. gun was a field modification during WWII, but without any extra parts on hand I simply clipped the barrels on the guns at the front and added a bit of plastic to make some semblence of a machine gun manned in the front seat. Since construction is minimal, these glue-up fast. I modelled a couple of the guns in the back thrown in the back seat as if those guys were moving fast to get into action before re-mounting their guns. After a quick spray of green armor basecoat, the crew get hit with some drab, brown and flesh paints and washes. Tracks get a black base followed on with some metallic dry-brushing. Guns and other details added from some leftover tank stowage get some gun metal, browns and weathering. I decalled the carriers with the Guards Armoured markings, and then everything got a splatter of muddy earth tones. 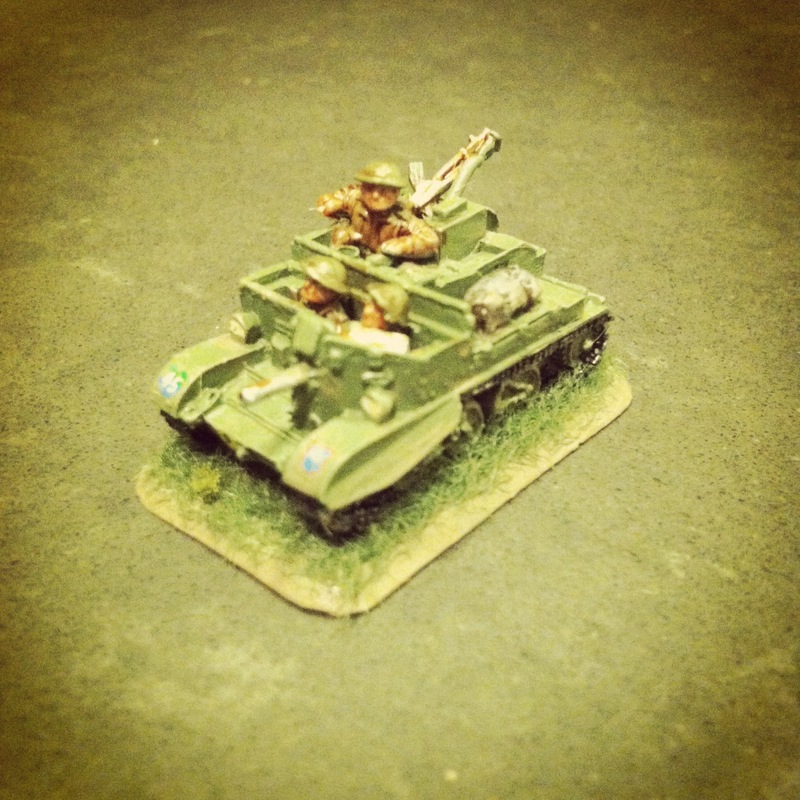 With so many British troops cruising around Europe in these vehicles during the war, adding just a few of these to my growing menu of options in creating British company lists for my FOW gaming at Metropolitan Wargamers in Brooklyn, NY was a good place to start. I’ll fill in these early war models with another three of the late war models at some point, making it into a nine carrier transitional platoon of old and new model vehicles. One of the reasons I wanted to expand my Allies with UK forces was the chance to model different infantry, armour and artillery. Getting these nifty little Universal Carriers into the mix will definitely give my games some new interest on the tabletop and hopefully wreak havoc on my German opponents. Love those bad boys. When I am playing late war I can never resist running 2 platoons one with 50cals and another as wasps. Now with my yanks I do find my self missing them a little.